No, seriously. I am fascinated. I caught a glimpse of a book about our mistreatment of them when we were at the Presidio in SF this summer. I almost bought it but I really prefer reading on my Kindle now, not traditional books. But so much on this subject available to me. I want to take advantage of that. 2. learning to play pool. Good. 3. studying home architecture, with an emphasis in the Craftsman style. 4. study the history of Native Americans. 5. do volunteer work of some nature. 6. work up to 10 hours a week, if it’s something I can do at home on the pc. If not, nah, unless money becomes tight. This entry was posted in Uncategorized and tagged Retirement on October 18, 2017 by Silver Willow. Various interests have come and gone in my retirement. Photography has kind of stayed and grown. You would love my house. I have a couple of dozen books on Native Americans and lots of Native American art work. You will be find you new “hobby” fascinating and a little sad, what we've done to them. Volunteer work is great, SW. There is much to chose from too. Photography and writing are important to me now as well. Hiking is important especially, as it gives me a sense of well being that is hard to match otherwise. I love the expression you have given us. 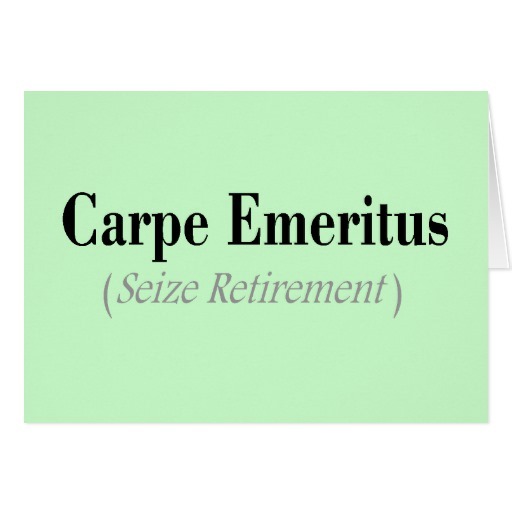 Carpe Emeritus! Ron loved retirement and was always put out by people who continued to work past retirement years. He always wanted to write a book on how to retire. He certainly did that well. I love that you love weather. If I were to retire I would want enough $$$$ to travel a bit before I worry about anything else. I will never not be busy, that just isn't who I am. But I think I know what I'd want to do, however, life happens so who knows. Photography is probably to be added to the list as well, although I'm finding I'm not quite as obsessed about it as I used to be. I don't know why it's dropped off my radar, but it has. Who knows though? I WOULD love it, I'm sure! Back in the late 80's or 90's, I was really 'into' the 'soft southwestern' decor (as I called it.) The pastel blues and dusty pink with Native American flare that was popular at the time. I'm sure I'll get back into that, and harmonize it with the beachy look I love. The colors are very similar… 🙂 And I LOVE Native American art! A LOT. There are several places I would REALLY love to visit, but the world is in such turmoil, and I'm still fractured from my horrible last experience at O'Hare; just not sure if I want to do much more distance travel, frankly. And / but yes, life happens. One is guaranteed nothing but the present. Travel has never interested me as I do not like being a tourist. I enjoy building relationships with people. I have done this through church work and with the school chaplaincy. I also give tours at a historical site in town that allows me to interact with a variety of people. I love social media and do some of that every day. Again, more relationship building. Travel has never interested me as I do not like being a tourist. I enjoy building relationships with people. I have done this through church work and with the school chaplaincy. I also give tours at a historical site in town that allows me to interact with a variety of people. I love social media and do some of that every day. Again, more relationship building. One thing that will amaze you when you retire – you will wonder how you ever got time to work! Seriously, I am “busy” all day and never have a bored or dull moment. The beauty of the new hobbies, if they are a hit, wonderful, if they are a miss, no big deal, just move on. Gardening became my passion when I retired. The amazing thing is with all the supposed free time, you will find yourself pushed to get all done. Think we take longer to do what we use to. I was given the 23 and me DNA thing from my brother. it has made me want to study our family history. I thought I would tackle that this winter. I have also enjoyed studying and researching tiny houses. I even tried my hand at designing a few. it was fun. I doubt I'll ever be able to have one… not even sure I would want it but I like reading about them and seeing what people do. and I read read read. and my reading is eclectic. I'm interested in everything! Exactly! I used to enjoy gardening, but let's face it, half the year in AZ it will be too hot to spend much daytime out in the heat. I've enjoyed watching a few episodes of the tiny house shows, but I know my claustrophobia would never allow me to live in a tiny house. Nope. I think the last house we lived in was a Craftsman (or Craftsman-style) house. We loved it. Blogging really is what keeps my mind active, but I also make those rather detailed photobooks for us and the kids. We also travel for new experiences. I enjoy Zumba and tai chi too which is good for keeping in shape. Oh my gosh! My first visit to A Gentle Breeze, via Misadventures of Widowhood, Ms. Jean! Just a perfect read. Full of energy, passion and love of grandkids! I'd say you have a fabulous list. And it's going to get longer. And not everything will get done. And you will be so busy and so happy!